NYC has recently announced plans for the completion of the final two phases of Riverside Park’s reconstruction. A pioneering “edge park” conversion of New York’s post-industrial waterfront – spanning 59th through 72nd streets alongside the Hudson River – Riverside Park South has been in the making for more than two decades. With no shortage of socio-political, jurisdictional, and geo-physical histories, Thomas Balsley Associates’ flexible plan has stood the test of time, responding with an ecologically sensitive plan that seeks to unite the adjacent neighborhoods with their waterfront, and provide a long-sought after amenity to the New York City’s west side. As the product of a unique public-private partnership, the park’s “interim” masterplan sought an inevitable relocation of the west side highway, sporadic government funding, and real-estate market demands. It has stood partially complete since 2008 after phases 1-4 were finished. 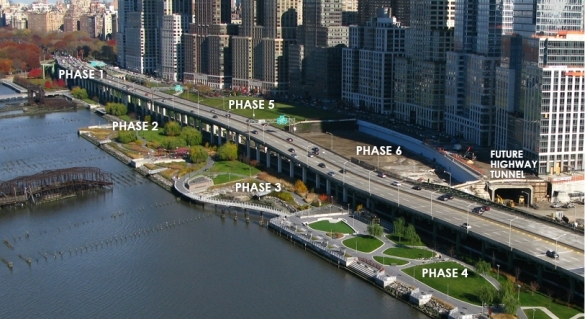 At the insistence of public sector forces to adopt the Thomas Balsley Associates’ team recommendations on a sub-surface relocation of the west side highway – beneath the park – Riverside Park South’s permanent plan nears reality along with completion of this publicly funded work. Read more and view the CB7 presentation here.